Thank you thank you thank you - QH is a fantastic add-on. You are SO appreciated! I don't know what help I can offer, but I have a BOATLOAD of alts - both sides - all levels. If you need data from anyone like me, feel free to ask. Any help my family and I can provide to you, we offer our assistance, even if it's just uploading data for you. We currently have one beta key, three active WoTLK (Horde) accounts, one inactive account with Horde and Alliance characters. I am a computer geek probably longer than you've been alive (yes, I coded in COBOL) but I don't know jack about lua. I can test the crap out of stuff. I am also a technical writer and can help with any documentation you wish to provide. Miss QH terribad! I just want to say thank you, for coming back and attempting to do this. I'm told by a lot of people to drop QH once they learn I use it, and no one I know seems to understand why I flat refuse to play the game without it. But even with blizzard having incorporated some of the QH stuff in.. I just like QH so much better. It's comfortable, and simple to use. I love the little green arrow that I can resize and relocate at will, and I loved how QH helped me track my achievements as well as quests. I never actively tried to do the critters for the killed achieve, or the /love critters.. I didn't bother attempting to search out the many books, and I had so many frustrations doing the explores. It drove me nuts, to head into an area on my map that was covered still, and it just wouldn't ding me having discovered it. I LOVED having those little markers telling me the place I needed to go to in order to ding the discoveries.. I just love this addon. I use a lot of them, but this is the first one I come to update after a patch, and the only one that I refuse to play without. Knowing that you are working on it has calmed my nerves so much. I have a years subscription pre-paid to the game, that would be wasted.. Again, thank you, so very much! Good luck man and thank you for making this! I do agree with you on the difficulties in coding for wow. If there were a quicker way to test-run an addon, it would be great. Even just a simple offline test cell with a stripped-down client to get the major issues straightened out and then test on live servers to deal with more variables, just seems like the way to go. But, I also think you're spot on deciding to rewrite now. Makes perfect sense to me. Live and learn, and then get dirty. :D One gigantihugormous world changing event comin' up! If it's half as pretty as it looks in my imagination, it'll be awesome. smariot, good luck to you, I'll be rooting for you all the way. With the improvements you plan to the API, do you also plan to improve the UI as well? In QH, Some of the text on the context menus is so small (and in a decorative font), it's hardly readable. I wanted to start over because I wanted a prettier API, and to change the way positions were handled; and since everything is so inner-connected, if I change one thing, it seems like I'll be changing practically everything, and I'll inevitably miss some bits, create inconsistencies, and create a debugging nightmare for myself. Debugging AddOns isn't fun. You can't step through functions, and God help you if you create an infinite loop somewhere, WoW simply locks up leaving you with no hint as to where the problem with megabytes of code to wade through. Changing the data representation will basically invalidate all the saved data, but since Blizzard is changing all the zones and quests, it would be invalidated in any case, so this is the best time to just start over. So, for the sake of my sanity, I wanted to just start with a clean slate. I've also been wondering why you decided to start over instead of picking up where the previous left off. (Even picking up where YOU left off, as the archives should still be available.) Just seems like it'd be easier. hi , been a fan of QH and ofc some other addons since the birth of wow , was just wondering if there was any kind of help i can give ? No, don't worry about QuestCollector yet. It's incomplete and full of debug message spam. Should I start loading the QuestCollector on the machines now, or should I wait? I'm gonna do my best to keep on top of this and help out, but a little bit of info would be helpful. I found two folders - you seem to have made the datamining a separate addon? Not sure why entirely. If you could give a bit of an idea of what we're starting with as a foundation, that'll let me know where to go from there. 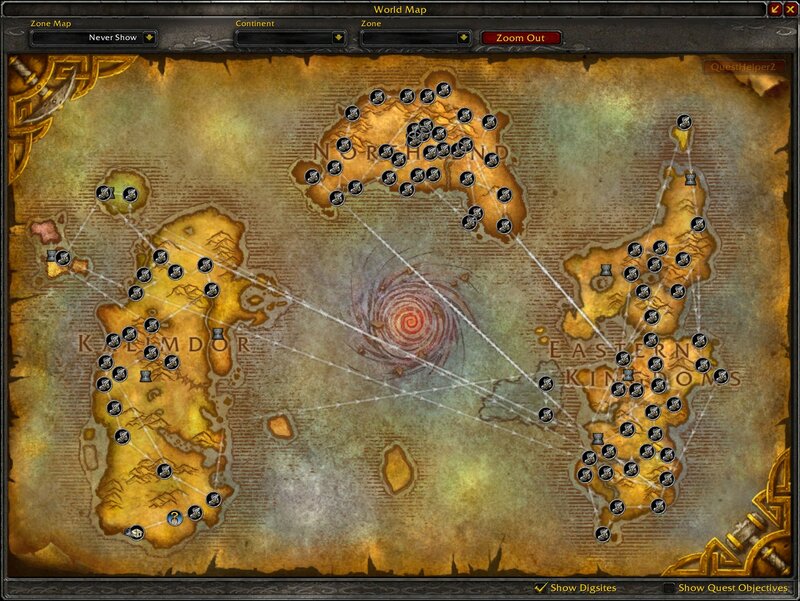 Will you be interfacing with WoW's (now) existing quest locations, drop zones, and prioritization (if its even possible)?